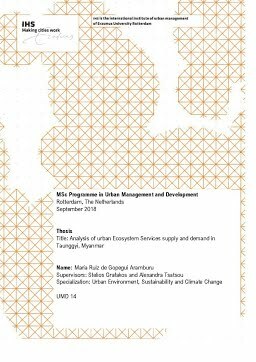 This thesis aims to analyse and understand the Ecosystem Services (ES) flow between the main urban and peri-urban green spaces (UGS) and the sociological system through a Supply-Demand perspective in Taunggyi, a medium-sized city in Myanmar, in order to assess potential mismatches and provide valuable information to support future urban planning and management. To this end, three questions were posed: (1) Which are the main green spaces in Taunggyi and how is the ES Supply distributed in the city? (2) Which are the main Ecosystem Services demanded in Taunggyi and how is the ES Demand distributed in the city? (3) How is the Ecosystem Services supply-demand balance distributed in Taunggyi and which factors might influence it? In this study, ES supply indicators aim to estimate the flow of an ES actually used or delivered, while demand indicators measure the level required or desired by the population. The research method was a case study, which employed a mixed method approach with both qualitative and quantitative data from primary and secondary sources, depending on the type of ES analysed: GIS base maps, satellital images, national and international databases, literature references, questionnaires and open-ended questions to local experts and ward representatives, and direct site observations. The methodological approach includes the following steps: (1) Quantification and mapping ES supply per UGS, (2) Quantification and mapping of ES supply per ward, (3) Quantification and mapping of ES demand per ward, (4) Analysis of the spatial distribution of ES supply and demand, (5) Identification of ES relationships (correlations and bundles), (5) Statistical analysis of potential influencing factors. Hence, information was mapped and analysed using GIS and SPSS software, focusing on five specific ES relevant for the context of Taunggyi: Water provision, Urban temperature regulation, Global climate regulation, Recreation and Education. Results from the analysis showed a clear mismatch in the ES distribution throughout the city from the Supply-Demand perspective, since the most populated (hence most demanding) areas in the centre lack any relevant ES supply while the forested areas in the peri-urban fringe provide several ES although the demand is much lower. In the case of provisioning and regulating ES this seems to be primarily related to the lack of UGS areas in the most centric wards, and in the case of cultural ES it appears to be also linked to inadequate infrastructure and management in existing UGS. Therefore, this research suggests that certain UGS should be protected and others submit to an adaptation and management plan regarding the actual and future needs as well as the proposals stated by local residents. Moreover, it is essential to develop a strategy for the measurement, control and management of water resources in the area in order to ensure future water security, and to extend town planning scope beyond municipal boundaries including in peri-urban areas. Analysis of urban Ecosystem Services supply and demand in Taunggyi, Myanmar The assessment and mapping of ES supply-demand balance in urban areas can serve as a valuable tool to guide city planning and resource management, so it would be convenient to perform cross-city comparative research with other middle-sized cities in Myanmar in order to get more generalizable results that could be useful for UGS management and urban/regional planning in similar contexts.